His predicament began when he agreed to represent members of the United Mine Workers of America (UMWA). Conflict had been brewing in mining communities on Vancouver Island’s central east coast since miners set up pickets in 1912. The coal companies refused to bargain and hired strikebreakers to keep their mines operating. “Special” constables, untrained and inexperienced, patrolled the region to keep order. In the summer of 1913, clashes broke out between strikers and replacement workers, starting in Cumberland and Nanaimo and spreading to Extension, South Wellington and Ladysmith. The provincial government declared martial law and sent in a militia on Aug. 13 after one man was killed, several surface mine buildings were burned down and homes were damaged. More than 200 strikers were arrested and 166 charged. None were granted bail. Martial law remained in the area for the next year. The union hired experienced Vancouver labor lawyers Joseph Edward Bird and John Wallace de Beque Farris to defend the accused members. A group of Nanaimo residents fundraised independently and hired Rubinowitz, despite being advised by union officials and their lawyers that he was too inexperienced. On that fateful Tuesday afternoon in September, Rubinowitz met with strikers Walter Pryde and William Moore on a Nanaimo street to discuss his clients’ cases. Special Constable Maguire and five other constables were patrolling the neighborhood. Maguire spied Rubinowitz and his companions and told them to move along. The trio continued walking, and were engaged in discussion when a train appeared and came to a halt. Twelve replacement workers disembarked, walking past the three men and the constables. “I don’t care who you are,” Maguire replied. “You put yourself in a false position,” the judge told him. “You are not entitled to make such a suggestion,” the young lawyer responded. Rubinowitz stood before a packed courtroom for a preliminary trial on the Friday. He objected to Simpson’s presence on the bench, arguing Simpson had implied his guilt at the bail hearing and criticized the selection of Shoebotham. The judge overruled both objections. Sam Davis, a Crown witness, was one of the workers coming off the train. He testified that he had not been spoken to by any of the accused and had not known anything about the incident until after their arrest. By this time, several of the 160 accused strikers had been sentenced, following “speedy trials” in Nanaimo. They pleaded guilty on the advice of lawyers Bird and Farris in the hope of appeasing the court. The remaining accused, having pled “not guilty,” were being tried in New Westminister. Rubinowitz represented 23 clients, while Bird defended 34. Most were granted bail and, when their trials finally concluded in the spring of 1914, nine went to prison, while others received a suspended sentence or were released because of time already served. Twenty-two men were pardoned. The last union man was released from prison Sept. 25, 1914. The union had been broken and many striking miners were blacklisted and had to find jobs elsewhere. Rubinowitz was still seeking vindication, despite his acquittal, suing the Nanaimo Herald publisher, J.R.H. Matson, and its editorial writer, R.R. Hindmarsh, for libel. Among the alleged statements was the suggestion Rubinowitz had been purposely “seeking notoriety” the day he was arrested in Nanaimo. The case was tried June 8, 1915, before Justice William Clement with Sidney Taylor, KC, representing Rubinowitz and Robert Reid defending the newspapermen. On the second day, a jury rendered a verdict in favor of Rubinowitz and the Herald was ordered to pay him $1,000 and legal costs. Israel Isidore Rubinowitz was the only child of Lithuanian Jewish immigrants, Louis and Toby Rubinowitz. The couple had been among thousands of Eastern European Jews emigrating to North America to seek better opportunities and escape the pogroms under Russian rule. Louis immigrated to New York City in 1879, at age 19, and traveled on to Pittsburgh, where many Lithuanian Jews had already settled. Two years later, he married Toby Rosenthal, and their son Israel was born in 1882. When Israel was 8, the family moved to Vancouver. of Western European Jews. Antisemitism does not appear to have been widely prevalent in the city’s early years. By the 1920s, this would change in Vancouver and elsewhere. Early tolerance of Jewish residents may be due in part to members of the dominant white population channeling their prejudicial treatment toward residents of Asian background. As well, only 83 Jewish people resided in Vancouver in 1891, increasing to 2,400 by 1931 – compared to 45,000 people in Toronto and 17,000 in Winnipeg. Louis operated a grocery in Steveston with two partners. In 1894, his family lived in Gastown, the city’s first downtown core. In 1896, Louis opened a department store, Rubinowitz and Co., on the main floor of the five-storey Dominion Hotel, at the corner of Water and Abbott streets. He sold clothing, boots, shoes and other goods. That same year, Toby’s sister, Sarah, 23, arrived from New York, divorced, pregnant and severely depressed. She gave birth to a son, named Abraham, and they lived with the Rubinowitz family. 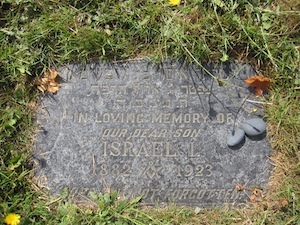 Israel was 13 when his aunt took her life, drowning in Burrard Inlet. At the coroner’s inquest, which confirmed death was by suicide, it was discovered Sarah had been pregnant and had an abortion. The coroner attempted to discover who the man involved with Sarah could have been, but to no avail. Louis and Toby continued to care for Sarah’s son and gave him their surname. While attending Vancouver High School and College, Rubinowitz helped his father in the store. He won academic awards in his senior year. He volunteered in the Duke of Connaught’s Own Rifles, a local militia that recruited from his high school. Following graduation with a bachelor of arts degree at McGill, Rubinowitz articled in two Vancouver law firms, his training temporarily postponed when he won a Rhodes scholarship – the second British Columbian to do so. He studied at Oxford University, then returned home to complete his articles. Attracted to England, Rubinowitz traveled overseas again to practise law for about two years before returning to Vancouver in 1911. He was admitted to the B.C. bar July 9, 1912. Living with his parents, Rubinowitz had only a short distance to walk to his law office on Granville Street. He became a member of the Masonic order, continued his involvement with the Vancouver Zionist Society (of which he was a founding member) and, during the First World War, was active as secretary of the B.C. Red Cross. When the First World War began in 1914, Sarah’s son, Abraham, was working as an electrician and carpenter. After the government implemented conscription in 1917, Abraham, 21, was drafted. Following his service, he moved to the United States. Rubinowitz had only been practising for a short time when, in May 1913, he took on the defence of a female nurse arrested for murder. Mrs. Ida Ironmonger, 43, was accused of administering drugs to Mrs. H.O. Anderson to induce an abortion, resulting in her death. Rubinowitz’s attempt to have his client released on bail pending the murder trial was unsuccessful. In October – only four days before his own trial in connection to the Nanaimo arrest – Rubinowitz convinced the court to reduce Ironmonger’s charge to “giving noxious drugs and aiding and abetting a deceased woman to commit an illegal operation.” In the four-day trial, Rubinowitz made the case, which included medical testimony, that “the act might have been committed by the deceased herself.” Ironmonger was acquitted after the jury deliberated a mere five minutes. Until 1968, abortion was illegal in Canada under the Criminal Code. “There is no place in Canada for the professional abortionist,” Judge Murphy told the court in reference to another Rubinowitz client, Joseph Kallenthe, who was found guilty by a jury in a Vancouver court in 1915. The judge also noted of the accused, “I have no doubt from the skill you displayed that you have had much practice.” Rubinowitz urged mercy, stating it was Kallethe’s wife and two children “on whom the brunt of the punishment will fall,” and Kallethe was sentenced to three years in prison. In 1918, Rubinowitz represented a couple who had taken out a marriage licence without a religious or secular ceremony. They had two children before learning they were not legally married. Rubinowitz corresponded with the B.C. attorney general’s office, stating it was “only fair, particularly to the woman, that every effort should be made to make the marriage valid and to make the children legitmate.” The government responded that the issue could only be remedied with a private member’s bill, an action his clients could not afford. The couple’s dilemma was submitted by letter to a newspaper editor, signed by a “Vancouver barrister.” This led a reader of the newspaper in the same predicament to write the attorney general. Consequently, the Marriage Act was amended, providing for the legitimization of children to couples in this legal situation. Rubinowitz was presented with his most challenging cases in the midst of Canada’s 1918-1919 “red scare” era. The federal government had suspended civil liberties, enacting the War Measures Act during the First World War in pursuit of “enemy aliens.” In the social turmoil after the war, fear of an uprising similar to the Russian Revolution in 1917 led to a government crackdown on left-wing activists. Panic – real and imagined – culminated in the spring of 1919 with the Winnipeg General Strike. By June, as the strike was nearing an end, the government amended the Immigration Act. A newcomer to Canada could not be legally landed if suspected of subversive activities, as determined before an immigration board. 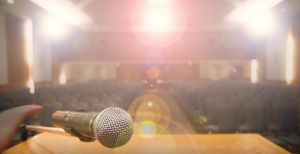 The verdict rendered – behind closed doors – could not be challenged in a civil court. A month following the amendment, 27 Russians in British Columbia were charged with participating in an anarchist ring connected to the Union of Russian Workers. Rubinowitz defended several of the accused. Secret service agents working with the Royal Northwest Mounted Police provided most of the evidence for the prosecution. After the hearings, the board ordered the deportation of 14 of the 27 men. Bird’s son, Henry, also a lawyer, acted for the local defence committee. He appealed the cases to the Ministry of the Interior. It was agreed that one of the accused would not be deported but had to report regularly to the police. In October, the other 13 Russians were sent to an internment camp at Vernon to await further arrangements. On Jan. 14, 1920, the case was moved to a higher court. Meantime, the detention camp in Vernon was closed. One of the 13 accused was released on parole and the others were transported to the B.C. penitentiary. In May, the two secret agents were acquitted, the judge deciding the evidence had not been sufficient to sustain a charge. Rubinowitz was ordered to pay $2,000 in court costs. The 12 imprisoned Russians were paroled that December but never deported because the government was unable to find a country willing to accept them. Considered a victory for left-wing activists, these detentions and those elsewhere in Canada had nevertheless served to send an intimidating message to politically active immigrants. Rubinowitz was a 41-year-old bachelor when he developed acute bronchopneumonia in the spring of 1923. In the early morning of Aug. 15, he died in his parents’ home. The burial was held the following day. His parents carried on. Louis ran unsuccessfully for mayor three times and for alderman five times over the ensuing years. He “achieved a reputation as an eccentric and perhaps this is why he was not a recognized leader of the [Jewish] community,” observed a writer for the Jewish Independent’s predecessor, the Jewish Western Bulletin. In 1939, Louis visited Vancouver archivist James Matthews to set down his stories. 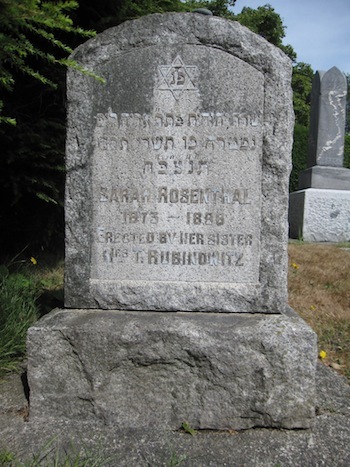 The Rubinowitzes are buried together in the Jewish section of Vancouver’s Mountain View Cemetery. Toby passed away in 1952, aged 90. Louis entered a provincial home for the aged in Coquitlam a few years after his wife died, passing on in 1958 at age 98. Sarah is buried separately on the edge of the Jewish section.